While researching for my recent story The Eating Habits of the Best Athletes in the World, I was surprised to learn that LeBron James and Sidney Crosby eat the exact same thing just before they compete. I was intrigued by the fact that two of the greatest athletes in the world, from two different sports, fueled up in the same manner. And I wondered if the habit extended even broader among professional athletes. LeBron and Crosby both eat a peanut butter and jelly sandwich before games, and it turns out many other top pro athletes do as well. I hadn’t realized that the peanut butter and jelly sandwich is the NBA’s secret addiction. The PB&J was credited as the secret weapon of the 2007–08 Boston Celtics championship season, and then it quickly spread across the rest of the league. Now nearly every NBA team makes PB&J sandwiches readily available to their players. And it doesn’t stop with the NBA. MLB legend Derek Jeter ate a peanut butter and jelly sandwich an hour before every game, NFL star Rob Gronkowski downs a PB&J (with a glass of chocolate milk) before every football game, and even golfer Dustin Johnson gets his energy for a round of golf from the same sandwich (although he opts for almond butter with his jelly). If it works for LeBron, Crosby, Jeter, and Gronk, it might just work for you, too. But why do so many athletes reach for a PB&J before the game? The most common explanation is that PB&J is comfort food and the athletes grew up eating it. This means that it is a soothing meal that puts athletes at ease before competition. In that sense, it is a meal that helps achieve peace of mind — a critical component for top performance. Athletes are also notoriously superstitious, so when they hear about a routine that works, they quickly look to gain that edge. The PB&J is also readily available, quick and easy to prepare, substantial enough to keep you satisfied, and yet light enough not to weigh you down. In terms of actual nutrition, a peanut butter and jelly sandwich is not the best, but it’s not bad. A PB&J does have healthy fats, carbs, and protein to provide quick energy. And you can boost the nutrition content by choosing 100% whole grain bread (which adds fiber) and low-sodium peanut butter. Jelly does contain a lot of sugar, but that isn’t awful if you are taking in the other nutrients. That said, it seems as though the benefits are primarily mental — our brain experiences pleasure when we bite into a PB&J, it makes us feel happy, and “when you feel good, you play well,” according to Brett Singer, a dietitian at the Memorial Hermann Ironman Sports Medicine Institute. After hearing about all of these great athlete stories, I decided to add a PB&J into my own pre-game routine. Granted, my athletic pursuits are quite different than LeBron or Gronk. But I do play in a regular squash league and am certainly game for some easy performance-enhancing tactics (legally, of course). Especially with matches in the evenings after a long workday, I need to find ways to keep my energy up. I learned this the hard way — there was one time when all I had was an apple between lunch and a 7pm match, and I could barely make it to the finish. It’s been about a month since I added the PB&J to my pre-match routine. I have been using Ezekiel 4:9 Sprouted Whole Grain Bread, Bonne Maman Raspberry Preserves for the jelly, and Teddie Smooth All Natural Peanut Butter. I have to say, it is one of the most satisfying things you can eat. And I now seem to have more energy on court, more strength in my legs, and more confidence knowing that I have adequately fueled up. Maybe it is just the placebo effect, but I do feel some performance benefits from a simple PB&J. Even if that just means feeling strong and playing to my potential, that’s a win for me. 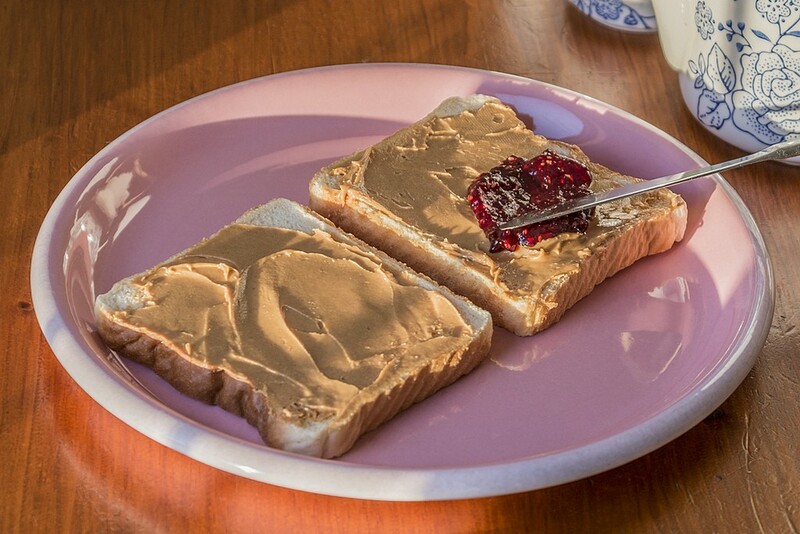 If you are also looking for a little performance boost, give the humble PB&J a try.